Western blotting analysis of A431 whole cell lysate probed with Rabbit anti actin beta (AHP2418). HEK293 (lane 2) cell lysate was run under reducing conditions on SDS PAGE and transferred to a PVDF membrane. Precision Plus ProteinTM Prestained Standards were run in lane 1. Rabbit anti actin beta (AHP2417) was used as the primary antibody at a dilution of 1/400 in lane 2. As secondary detection reagent HRP conjugated goat anti rabbit IgG (STAR208P) was used at 1/10,000. Visualization was carried out using the ChemiDocTM MP Imaging System with automatic exposure. Rabbit anti actin beta antibody recognizes the product of the ACTB gene, cytoplasmic actin beta, also known as actin cytoplasmic and beta actin1. Actin beta is ubiquitously expressed in all eukaryotic cells, playing a critical role in cell survival, motility and re-modeling. Actin beta is highly conserved throughout evolution, with all vertebrate and invertebrate species reviewed to date bearing a 98% or greater amino acid primary sequence identity to human actin beta. Plant species also exhibit a high degree of primary sequence conservation displaying considerable similarity to animal actin beta. For example, nearly 90% sequence identity is observed between human ACTB and the model plant species Arabidopsis thaliana (mouse eared cress) ACT1 (Arabidopsis) gene products. 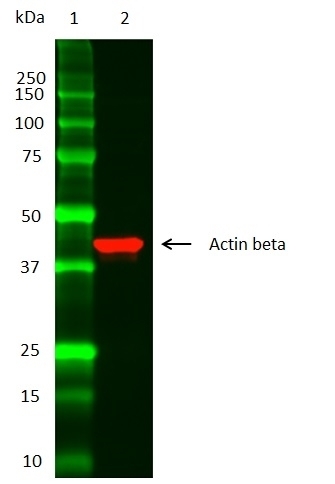 Actin beta is a commonly used western blotting loading control. Chen, X.J. et al. (2018) Association of reduced sclerostin expression with collapse process in patients with osteonecrosis of the femoral head. Int Orthop. May 21 [Epub ahead of print].